Based on the novel A Painted Devil by Thomas P. Cullinan, The Beguiled is the story of a wounded Union soldier who is taken in to an all-girl’s school in the American South where his presence would cause a disruption among the girls and women at the school. Written for the screen and directed by Sofia Coppola, the film is different take on novel as opposed to the 1971 film directed by Don Siegel as it is more about women giving into temptation and girls dealing with the presence of a man during the American Civil War. Starring Nicole Kidman, Colin Farrell, Kirsten Dunst, Elle Fanning, Angourie Rice, Oona Laurence, Emma Howard, and Addison Riecke. 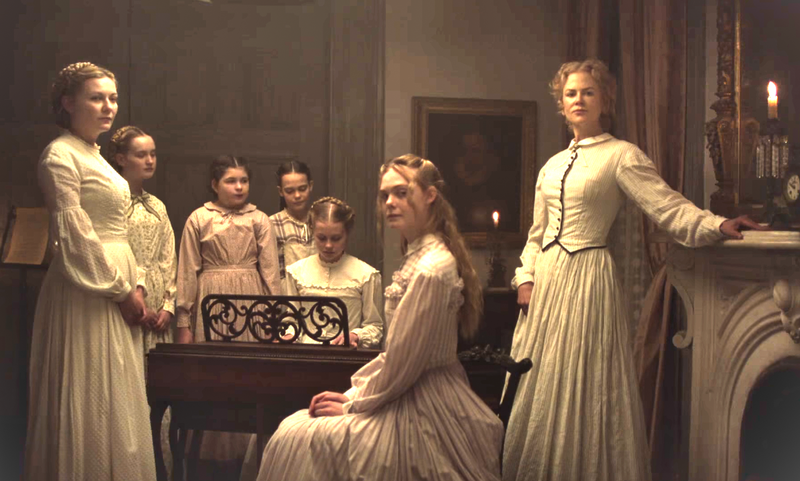 The Beguiled is a rich yet eerie film from Sofia Coppola. Set in 1864 Virginia during the American Civil War at an all-girl’s school that is isolated from the battlefields and towns in the South, the film is a simple story in which a young girl from that school found a wounded Union soldier as she takes him in to the school where he’s to be healed from his wounds. Yet, his presence at the school would mark a change as the film is more about the life of these women at a school where they live in a very remote and isolated environment away from the battlefield while being aware of what is happening outside of the school. Even as there would be Confederate troops stopping by every once in a while to check up on the school as its headmistress Miss Martha Farnsworth (Nicole Kidman) is running the school as she knows the procedures of what to do when a Yankee is at her home while a couple of the students would be lookouts. Miss Farnsworth is definitely a maternal figure of sorts for all of the girls as she is just trying to do her job as she is trying not to give in and do what needs to be done. In Morrow, here’s a woman that is quite worldly but has a melancholia to her having been cooped up in the house for so long as she sees Cpl. McBurney as a way out of the school. Then there’s the teenage student Alicia (Elle Fanning) who is fascinated by Cpl. McBurney as she would try to seduce him as it would set things off at the house. Especially with the second half of the story as it’s tone as this calm and carefree story would become something much darker. Notably as it play into all of these elements of temptation and lust as well as the attempt to return things to normal as it involves a sense of danger and suspense. Another aspect of Coppola’s script is the attention to detail she has in some of the dialogue as it help play into some of the plot schematics as well as in the characters as a couple of them are suspicious of Cpl. McBurney’s presence. Coppola’s direction is truly ravishing in not just creating a film that is filled with gorgeous imagery but also create something that is quite claustrophobic in its setting as well as in using the 1:66:1 aspect ratio which is an offbeat look for the film. Shot on location in Louisiana with many of the interiors of the house shot at the actual home of actress Jennifer Coolidge. Coppola uses the many exteriors to play into a world that is quite detached from the action of the American Civil War as Coppola’s usage of wide shots would help play into that world as well as knowing where to use the wide shots for scenes that are crucial to the plot. Many of the interior shots in the film would have Coppola use a lot of medium shots with some wide shots and close-ups as it aspect ratio help play into the film’s claustrophobic tone as well as show a world that is very orderly with everyone having a role to play. Coppola would create moments that are intriguing such as the conversations Cpl. McBurney would have with Miss Farnsworth and Morrow as she knows where to frame them and play up the sense of temptation that looms throughout the film. By the time the film reaches that shift in tone to play into some of the suspense and heightened drama. Even as Coppola knows where to use a close-up or a medium shot in certain moments as create something that is very suspenseful without the need of a music score to build it up. Notably in a scene where everyone is having dinner as the dialogue would play into things that help add to the suspense as it is Coppola’s attention to detail that is so important which makes these little moments in the film so important. Overall, Coppola creates an evocative yet chilling film about a group of girls and women bringing in a wounded Union soldier during the American Civil War. Cinematographer Philippe Le Sourd does incredible work with the cinematography as its emphasis on natural lighting doesn’t just play into much of the exteriors set in the day and night as well as some of the daytime interiors but also in the usage of candles as the source of light for many of the interior scenes at night as they’re just gorgeous to look at. Editor Sarah Flack does excellent work in the editing with its usage of jump-cuts in some scenes as well as allowing shots to continue for a bit rather than go into a straight fast-cut as it is one of the film’s highlights. Production designer Anne Ross, with set decorator Amy Beth Silver and art director Jennifer Dehghan, does amazing work with the look of some of the interiors at the Coolidge house as well as provide the right kind of furniture and props that were used in those times. Costume designer Stacey Battat does fantastic work with the look of the white dresses the girls and women wear as well as Cpl. Burney’s uniform as well as the formal gowns that the girls and women wear for the special dinners. The makeup work of Stacy Kelly does terrific work with the makeup the girls would wear for the formal dinners while Elvis Jones would provide the look of Cpl. McBurney’s wounded leg. Visual effects supervisor Joseph Oberle does nice work with the film’s minimal visual effects as it relate to the Cpl. McBurney’s wounded leg as it would also serve as a key moment for the film’s third act. Sound designer Richard Beggs, along with co-sound editor Roy Waldspurger, does brilliant work with the sound from the way cannons and gunfire are heard from afar to the sparse moments at the house as well as some of the most chilling moments in the film. The film’s music mainly feature music that is performed on location whether it’s sung or performed in a music room as it’s mainly the traditional music of the time while the score is essentially a variation of Claudio Monteverdi’s Magnificat performed by Phoenix with arrangements by Laura Karpman as it only appears sparingly in moments that are very quiet. The casting by Courtney Bright and Nicole Daniels is wonderful as it feature a few notable small roles and appearances from Wayne Pere as a Confederate captain, Matt Story as a Confederate soldier, and Joel Albin as a cavalry officer as they appear briefly to check on Miss Farnsworth and her school. Addison Riecke is superb as Marie as one of the young students who takes a liking to Cpl. McBurney as she would help him while Emma Howard is fantastic as Emily who is a bit suspicious of Cpl. McBurney as she is just trying to do her duties while lamenting the loneliness she and the girls are dealing with in their environment. Oona Laurence is brilliant as Amy as the girl who would find Cpl. McBurney as she would take a liking to him while raising concerns about what would happen to him. Angourie Rice is excellent as Jane as the prim student that is also suspicious of Cpl. McBurney as her own father is an officer for the Confederate while being a very talented musician. Elle Fanning is amazing as Alicia as the teenage student who takes a great liking towards Cpl. McBurney as she sees him as an object of desire where she would vie with Miss Farnsworth and Morrow for his affections. Kirsten Dunst is incredible as Edwina Morrow as a teacher who lived in towns and know a lot about the world yet is someone that is quite melancholic who keep things to herself as she falls for Cpl. McBurney in the hopes she would get out of the school. Colin Farrell is remarkable as Corporal John McBurney as an Irish immigrant who joins the Union for money as he becomes wounded and later cared for by Miss Farnsworth, Morrow, and the students where he tries to return the favor only expressing his fear in returning to war but also would do things that play into his own desires. Finally, there’s Nicole Kidman in a phenomenal performance as Miss Martha Farnsworth as a school headmistress who is a deeply religious woman that is trying to maintain order as she copes with the temptation of Cpl. McBurney’s presence as well as make sense of the chaos that would come later as Kidman definitely sells that sense of conflict and torment that shows a woman who has been through a lot but is trying to maintain some sense and order in her school. The Beguiled is a tremendous film from Sofia Coppola. Featuring a great ensemble cast, gorgeous visuals, intoxicating sound work, masterful editing, and a hypnotic music soundtrack. The film is definitely a very unusual yet entrancing suspense-drama that explore women dealing with temptation by a man’s presence as well as an exploration of innocence loss during one of the tumultuous periods in American history. 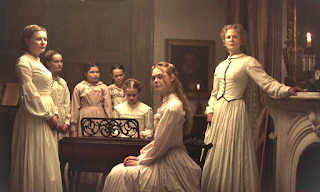 In the end, The Beguiled is a spectacular film from Sofia Coppola. Great review, I saw this recently myself. My only issue was Elle Fanning, she's usually so good so that threw me off a bit. I loved your review. It has me very excited to see the film and what Coppola does with the material. Hell yes, so glad you liked this one. I like that you didn't spend much time at all comparing the two films, because really, there is no comparison. Great review my friend! @Brittani-Well, her character is actually more restrained in this film than in the other one as I think it's the right tone for Sofia's version. @Sati-Don't worry. You'll get to see it and I hope you enjoy it. At least you can have the time to watch the 1971 Don Siegel film if you haven't seen it already. @Alex-There's no point in comparing the 2 films as they're both very different. Plus, I think Sofia did more with the ensemble than Siegel did.